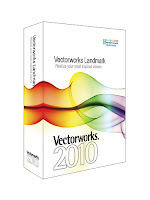 It's been about nine months since the good folks at Nemetschek sent me an evaluation copy of Vectorworks Landmark 2010. Rather than rush to conclusions, I've used the time to put the program through its paces in a variety of real landscape design projects, and over the next several posts I'll share my experiences. 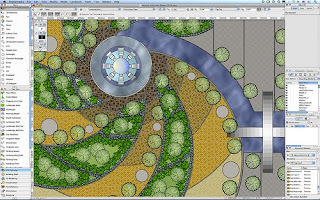 This series is written for the landscape designer who has some experience with CAD and other digital production tools, and is considering purchasing Vectorworks or upgrading to v2010. It's definitely not a tutorial, a treatise on CAD, or a technical analysis. (Frankly, some of my frustrations with the program probably stem from the fact I'm running it on my MacBook Pro, not an optimized workstation.) It also is not an exhaustive review, of which there are several already. Instead, it's a quick look into one possible way of using Vectorworks Landmark to make your landscape design process just a bit more efficient. If you use it differently, or feel I should, I would love to hear from you. 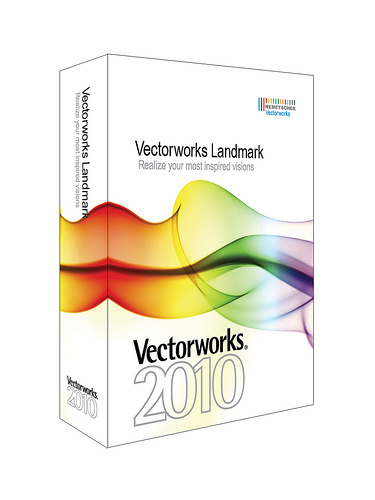 In this first installment, I'll look at the most basic basics of working with Vectorworks Landmark 2010: setting up documents, organizing your work, and drafting basic 2D forms. Since it has such strong roots in the Mac's graphical interface, using VW has always been very intuitive for me. Open up a new document, and almost immediately it's obvious how to begin drafting. 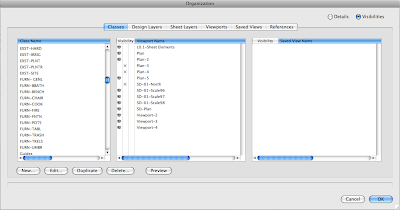 Tools can be selected either from graphical palettes which can be "torn off" and placed anywhere on the screen, or by customizable key commands. Better still, your entire working environment can be customized -- including which tools appear on which palettes, how your cursor behaves, default line weights, and so on. In fact, there are so many ways to customize your workspace, VW has had a hard time consolidating preferences. As a result, it's hard to keep track of what lives where: dashed-line styles are in the File>Document Settings menu, while line weights are in the Tools>Options>Line Thickness menu. 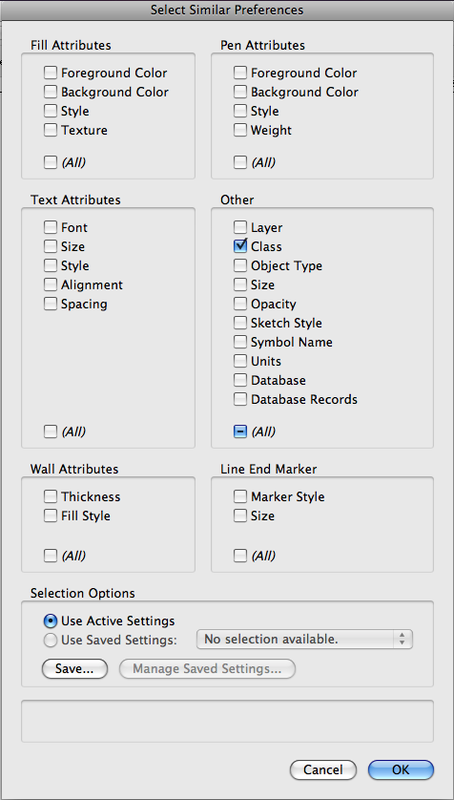 Cursor appearance is controlled from either the Vectorworks>Preferences menu or the Tools>Options>Vectorworks Preferences menu; but cursor behavior — e.g. snapping to endpoints, constraining to angles, showing extension lines from reference points — is in the Tools>Options>SmartCursor Settings menu. I love being able to hack almost every aspect of the program, but I'd also love to see these controls organized more logically. Save time: select like objects at once. It probably is most efficient to begin from a template document including your customized workspace, key commands, style standards, frequently used plant and other symbols, object classes, and sheet and design layers. In practice, though, I usually wind up starting with an existing client file and doing a "Save As…" to make a new document. Sometimes this results in strange behaviors, such as broken resource links, and VW makes it very easy to renew the link, change it, or delete the resource entirely. One of my favorite new features is the "Select Similar" tool, which allows me to select objects of like size, shape, color, line weight, opacity… any combination of 27 different criteria in all. This is a massive time-saver when I want to, say, delete all the boulders in a design, or increase the line weights of all my trees, or make all the guidelines on one particular design layer visible. 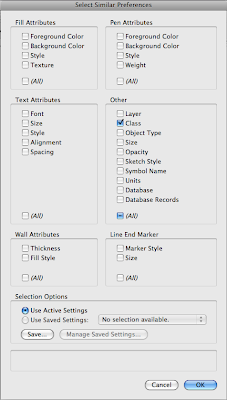 Speaking of design layers, if you're an AutoCAD user you might not be sure what I'm talking about: you're accustomed to drafting mostly in "model space," producing sheets in "paper space," and assigning objects to "layers" with unique attributes and visibilities. Be forewarned that VW uses a different (and, to my mind, more accurate) parlance to organize your work: drafting happens mostly in "design layers," sheet production happens in "sheet layers," and objects are assigned to unique "classes." Like AutoCAD, though, VW does use "viewports," and has the ability to reference external drawings (even though VW doesn't call it XREF). I do know designers who do all their VW drafting to scale on sheet layers; I truly don't understand this, as VW allows so much more flexibility when you commit to using design layers, classes and viewports (plus, the learning curve to master them is so blessedly short). Best of all, VW makes it easy to save sets of classes and layers as defaults, so your trusty favorites are right there whenever you start a new document. I won't go into detail here on how I structure layers and classes in my files, except to say that I like to parse them as finely as possible for maximum control over the appearance of my plans. If you'd like to know more, feel free to write me. 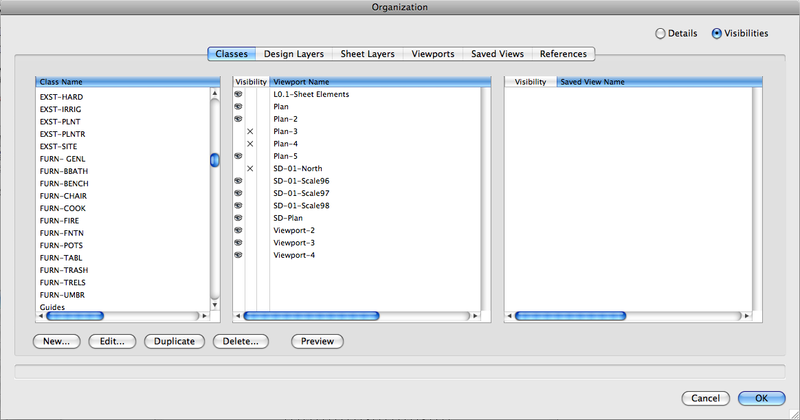 Organizing with layers & classes makes presentation infinitely easier. Drafting in VW is exceptionally easy. A house footprint, for example, can be created as a series of discrete lines, as a single polyline with multiple corner points, or even as a series of intersecting rectangles combined into a single shape (i.e. with their overlapping areas removed). No matter which method you choose, the lines can then be converted to a VW wall object, with depth, height and the ability to have predefined door and window objects inserted. Although it's a bit of overkill for a landscape plan, it takes so little extra effort beyond the creation of the original polygon that I almost always draft structures this way. Curved shapes are only slightly more difficult: you can begin with a circle, a regular arc, or a polyline with Bezier, cubic or arc vertices. Any of these can be decomposed into their constituent segments, for additional editing or conversion to a VW object such as a wall, property line, or landscape or hardscape area. 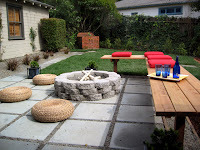 (The landscape/hardscape area is a nice touch, and improved for 2010: you can assign materials, patterns and unit costs and VW will help calculate square footage and total costs.) Also new in VW2010 is a feature AutoCAD users have enjoyed for some time: the ability to start drawing an object with a mouse click, then key in dimensions to have it completed automatically. Someone wrote that AutoCAD basically draws lines, while VW basically draws shapes. It's a convenient distinction, and anyone familiar with Google SketchUp will know how much faster it can be to define a rectangle than to draw four lines at right angles. VW now provides four ways to draw a rectangle; six ways to draw a circle; two oval modes; regular and irregular polygons; polylines; spirals; and even freehand lines with varying degrees of smoothness. Again, any of these can be decomposed into segments and edited, or converted to objects, or spliced together or intersected to make complex forms. I have yet to hand-draft a line or shape that I couldn't replicate in VW — however, as with most digital tools, this demands a fair investment of time, so it's usually not appropriate in the early stages of design. The new version offers a plethora of "smart" drafting aids, such as snapping to points, edges, vertices and predefined angles; zooming into the spot you're drafting; and varying degrees of visual cues such as highlighting snapped objects and available points. Again, these aids are customizable to a fault, and I found them useful when I was getting to know the program but now have them disabled to reduce the "visual noise" in my workspace. In my next post I'll explore the more landscape-relevant features of VW Landmark 2010, including dimensions, plant libraries and symbols. In the meantime, if your appetite is whet I would recommend diving into (a) the Vectorworks website, for descriptions and demonstration videos; (b) the Vectorworks user board and/or the VectorWorking community, which contain lots of tips as well as insights into what problems people are having; and (c) the undisputed champion of Vectorworks third-party support, Jonathan Pickup and his Archoncad site. And as always, if you have questions or corrections on what I've written here, please give me an earful. 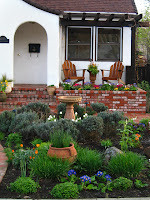 As my voicemail fills with eager requests for landscaping ideas before summer slips away, here's some wisdom from a few years back that bears re-posting. 3. Don't pick a designer just because theirs is the biggest ad in the phone book or at the top of the search engine ads. That's only an indicator of how much advertising they do; it tells you nothing about the process or quality of their work.